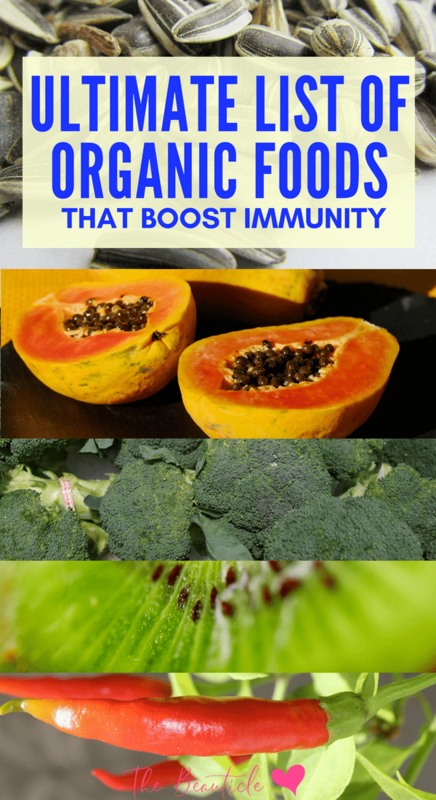 There are many benefits to eating a clean organic diet and one of them is that they can boost your immune system. Some organic foods do a stellar job at this and they will be highlighted in this article. Flu and cold season is usually in the late fall and winter but you can get sick anytime, especially if you care for young kids. The best way to fight illness is to have an immune system that protects you from the beginning and that can keep you from getting sick in the first place. It all begins with diet if you want a good immune system. Don’t flood your system with processed foods and instead eat immune-boosting fruits and vegetables. To enjoy all the benefits of a good immune system, you want to eat a lot of fresh, raw organic produce. The fresher the food, the more enzymes, and delicate proteins will remain in the food you are eating. Organic produce is grown without pesticides, and organic farming actually increases the number of nutrients that the fruits and vegetables provide. There are many antioxidants in food that will keep your cells healthy enough to block invasions by bacteria and viruses. Fresh produce is high in antioxidants, including the all-important beta-carotene, vitamin C, and vitamin E.
These are found in colorful fruits and vegetables, and especially those with purple, blue, red, orange, and yellow hues. Oranges are high in vitamin C, but chilli peppers, red and green bell peppers, kale, cauliflower, Brussels sprouts, kiwi, broccoli, papaya and strawberries actually have more. Of course, a multivitamin with a lot of vitamin C in it can help you if you don’t always have access to healthy foods. Take one vitamin a day and add extra vitamin C if you feel an illness coming on. Superfood powders will also help you when you’re in a pinch. Beta-carotene can be found in apricots, turnip and collard greens, tangerines, tomatoes, and watermelon, nectarines, peaches, pink grapefruit, pumpkin, asparagus, beets, broccoli, cantaloupe, carrots, corn, green peppers, kale, mangoes, squash, spinach, and sweet potatoes. Aim to eat a salad every day that is mixed with raw garlic. Garlic is a natural immune enhancer that also helps the liver function better. Some people take garlic as they would a multi-vitamin, by simply slicing the garlic in half and swallowing it with some water or juice. That is how beneficial garlic is when raw, it can help to heal may ailments. Green smoothies and power shakes are all the rage right now. Here’s a list of ingredients that you can either mix together or add to your daily smoothie/shake to help boost your immune system. These ingredients, when taken as directed above, will be one of the best natural multivitamins you can get your hands on. Of course , you can always just skip the “making it yourself” part and simply buy a green superfood powder packed with many of these ingredients. This natural mixture makes for good influenza protection. 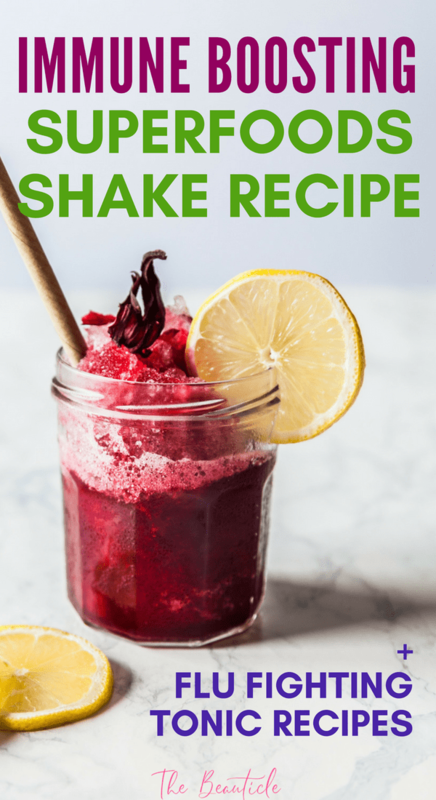 Mix a spoonful each of turmeric powder, wheatgrass powder, cranberries, an inch of fresh ginger grated or ginger extract and freshly squeezed lemon. Drink a two-ounce shot for the easiest time on your stomach. Your immune system will be strong, especially during flu season when everyone is sick around you. Drink either of the above juices once daily before eating anything else. You can also use organic apple cider vinegar for sinus or throat ailments. It makes your breath smell a bit like old shoes but you will feel better overall. Drink a lot of fluids during flu season and try detoxifying your body with stevia-sweetened cranberry lemonade mixed with cayenne pepper. All of these agents fight infections. Echinacea is good for the prevention and treatment of viral infections, especially when you mix it with a source of vitamin C.
Take Echinacea every day for a week but no longer. If you still feel you need it, wait after a five day rest period, then you can do another week of it. Click here to check prices of echinacea supplements or try the tea below. All of these remedies can be made completely with organic materials so you can keep your organic lifestyle while being healthy at the same time. An Amazon Fresh subscription is a great way to save on the above organic grocery and superfood powders when ordering them online. They deliver groceries every month straight to your home for a super low monthly price. Talk about convenience. Try it out for free! Find all the details and get a free trial to Amazon Fresh here. You already know that eating clean is better for you and your healthy lifestyle, but there can be some drawbacks to switching to an all-organic diet. Processed foods come with a number of disadvantages, but they are known to last longer than organic food as they are filled with shelf life extending preservatives and additives. Of course, many want to get away from eating these unnatural chemicals and since organic foods do not have the preservatives found in most other foods, they tend to spoil much faster, meaning you can lose a lot of food and money if you don’t eat them right away. Unfortunately, you can’t always eat the food you buy in a timely manner. Some nights you may eat out, other nights you might have leftovers, and so on, meaning that your organic foods aren’t always eaten within a few days of reaping or purchase. When you buy organic food, it is best to buy a little at a time so you can eat in a timely manner and not let it spoil, but of course, we all have busy lives and this is simply not always possible. Fortunately, there are some ways to keep your organic food fresher longer. Check out these tips for preserving your organic fruits, veggies, meats, and grain products. • Set Your Refrigerator Between 38-40 Degrees Fahrenheit: Cold temperatures are the best way to preserve fresh foods, but you want to make sure they don’t freeze. Keeping your fridge at this temperature will ensure that your organic foods are kept as cold and fresh as they can be without freezing over. • Be Mindful of Expiration Dates: On some foods, you can safely ignore these dates, but when it comes to organic food, you should always pay attention. Expiration dates will help you plan accordingly when planning your weekly meals. When you know exactly how many days you have until something spoils, you’re more likely to be on top of cooking and preparation. Always pay attention to expiration dates when out shopping for organic foods. • Wipe Down Fruits and Veggies Before Storage: Always wash and wipe fruits and vegetables before storing to prevent moisture build-up. Fruits and vegetable s naturally give off a gas, ethylene, when they ripen. Over time, this gas causes them to become riper a riper until they eventually spoil. When you add moisture into the mix, things like mildew and mold can grow on the fruits and veggies, making them dangerous to eat. Avoid this by wiping down the foods, storing them apart, and avoiding the use of plastic bags, which can promote condensation. • There are Different Ways to Refrigerate Meats: Depending upon the type of meat and when you’ll be using it, how you store meat can vary. For fresh meats you intend to use within two days, refrigerate between 38 and 40 degrees. If you are going to freeze meat for a later date, be sure to wrap it in freezer paper, foil, or leave it in its original packaging. Some meats like smoked bacon and ham can simply be wrapped up in vinegar-soaked cloth. For meats you’ve already cooked, allow them to cool completely before placing them in the fridge to ensure freshness. • When it Comes to Grains: Your dry whole grains, such as cereals, grains, and bread, must be stored in different ways depending upon their needs. For example, bread should be stored in a cool, dry place like a cupboard or a breadbox. You can also freeze bread you do not intend to use in the next few days. Always be watchful for mold and mildew if loaves of bread are stored in or near a moist place. For cereals, always close the inner bag of the cereal box to keep it fresh. Leaving it open to the air can cause it become stale. Lastly, for things like cookies and cakes, keep these in an airtight container to keep them soft, moist, and flavorful.